With the motor running, add the vinegar and 2 teaspoons salt. Slowly drizzle in the olive oil. The mixture will turn bright orange or dark pink and become smooth and emulsified, like a salad dressing. If it still seems watery, drizzle in more olive oil until texture is creamy. Strain the mixture through a strainer, pushing all the liquid through with a spatula or the back of a ladle. Discard the solids. Chill the dressing for at least one hour but it will get better if you leave it in the fridge overnight. Before serving, adjust the seasonings with salt, hot sauce and vinegar. Place all of the ingredients in a bowl, dress liberally with the dressing and serve. Place the cucumbers into a food processor set with the chopping blade and sprinkle with salt. Pulse a few times to get the cucumbers to look like coarse oatmeal. Add the basil, lemon zest and juice and purée until smooth and slightly green in color. Place the purée in a mixing bowl and whisk in the yogurt. Adjust the seasoning with salt. Toss the spaghetti in the dressing and serve. Add the eggs and olive oil and mix until the dough has been formed. Turn the dough out onto a floured work surface and knead for approximately 5 minutes. Cover the dough with a damp cloth and allow to rest for 30 minutes. Mix all of the ingredients together in a mixing bowl until soft and well combined. To make the tortellini, Cut 3 inch squares out of the sheets of pasta. Place ½ teaspoon into the center of each square. Brush the edges of the square with water and fold over to seal. Fold back around your finger and turn down the edge to form a tortellini. 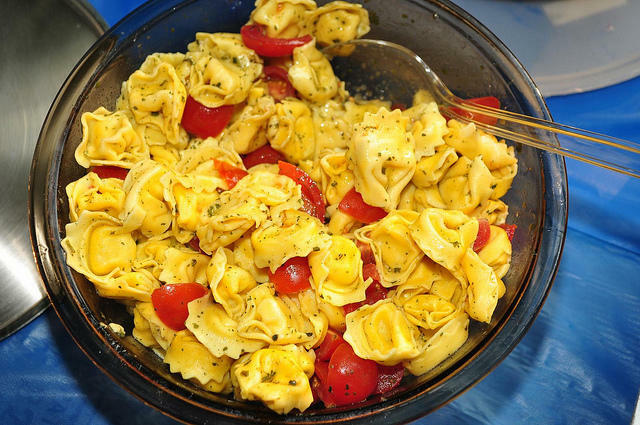 Cook the tortellini in a large pot of boiling water until they float. Remove and toss in some extra virgin olive oil. Keep warm. Char both sides of the tomatoes under the broiler or with a torch. Put the charred tomatoes and the rest of the ingredients in a large bowl. Add the warm tortellini and toss a few time to coat the pasta and divide up into bowls. Top with grated parmesan and some extra oil from the garlic confit. Place the garlic cloves in a small sauce pan and cover with the olive oil. Cook the garlic cloves at 150°F for two hours. Allow to cool to room temperature. Place in a jar with a tight fitting lid and store in the refrigerator for up to one month. Put 2 1/2 cups of the flour into a bowl, make a well in the flour, and add the cheese, eggs and salt. Gradually work the mixture together, adding more flour if necessary, to make a soft but not sticky dough. On a lightly floured surface, knead the dough until it is smooth. Let the dough rest in the refrigerator, wrapped in plastic, for 30 minutes. Toss all the ingredients together to coat well and serve warm.